Tattooing has been a cultural practice and an art form that goes back thousands of years. In the United States, nearly twenty percent of the population have tattoos, and the number is continuing to trend upward. Professionally made tattoos are permanent markings on the body made with inks injected into the skin. For many people, their feelings about their tattoos change over time. In these cases, there is laser tattoo removal. Laser tattoo removal is a great solution for those who have a tattoo they regret due to lifestyle changes, poor execution or changes of tattoo appearance due to aging. 6 How Does Laser Tattoo Removal Work? 8 Is Tattoo Removal for Me? Using the latest in laser technolog, we can now offer Tattoo Removal. Our PicaCare 450 Laser treatment utilizes the fastest laser wavelength technology available. The PicoCare 450 is the ultimate laser tattoo removal system, employing a 4-wavelength picosecond laser. Older laser systems have operated with nanosecond pulses, which means each pulse of laser lasts a nanosecond (1 billionth of a second).These wavelength proved to have a significant limitations for tattoo removal. Taking lessons from the nanosecond laser systems, the PicoCare 450 was developed. The PicoCare 450 has “picosecond” laser wavelengths, which last one trillionth of one second long. This translates to even shorter treatment times and better results. The PicoCare 450 is clinically proven for removal of all colors, which is not true of any other system currently available. The concentration of power of such a short burst results in more effective breakdown of tattoo ink particles. Laser tattoo removal is not exactly new, but the ability to erase tattoos with a laser has been limited to certain colors of ink and certain skin tones. Advanced in laser technology and pulse methodology gives us the most power laser tattoo removal system yet. Lutronic’s q-switch laser technology is capable of removing a wide range of colors on a variety of skin pigments. PicoCare 450 is a more advanced system compared to the Picosure laser system. The Picosure was the first picosecond pulse laser technology made available for laser tattoo removal. Since it’s arrival on the market, the PicoCare 450 has pushed the envelope on the efficiency of tattoo removal. Another system we offer is the Lutronic Laser. The Lutronic Tattoo system channels concentrated light to carefully break down the inks of a tattoo into tiny fragments without damaging the surrounding skin-allowing the body to naturally dispose of the tiny ink particles. Tattoos come in a huge variety of colors, shapes, and sizes. Though once regarded as taboo and unprofessional, tattooing has become extremely popular and accepted in the last decade. Millions of young people across the country get tattoos each year, and the number grows larger each year. Tattoo techniques have evolved over the years, but the technology has pretty much remained unchanged in fifty years. To apply tattoos to the skin involves using a sterile needle to puncture the skin and inject ink into the dermis layer, which is the second layer of skin underneath the outer epidermis. When ink particles reach the dermis layer, the body reacts by sending collagen and white blood cells to the inked skin cells. This is your body’s natural healing response at work. Since ink particles are too large for white blood cells to destroy, a new layer of skin is built around the ink particles. This process is what gives tattoos their permanence. Previously, tattoo removal was achieved using methods like dermabrasion or surgical excision. These techniques have ultimately proven limited and were often painful. In the 1960s, lasers were first applied to tattoo removal with limited success. Since those days, we’ve come a long way and now have Q-switched lasers that produce effective tattoo removal. Selective photothermolysis is a process where heating generated by the laser pulse is absorbed more readily by ink particles. This process is also used for treating skin discoloration,spotting and dark blemishes of the skin. At Skin Perfect Medical Aesthetics, we use the Lutronic Laser Tattoo removal system, a state-of-the-art laser. Lasers are effective for removing tattoos and color pigments in the skin due to a process called selective photothermolysis. When the ink particles are heated by the laser, they vibrate rapidly and are destroyed. Since the ink particles absorb heat first and rise in temperature faster than surrounded tissue, they are destroyed without doing any damage to surrounding tissue. The Lutronic Q-switch laser is the gold standard of laser tattoo removal because it is capable of delivering very short, but very powerful bursts of energy. There are a few key aspects that make the Q-switch laser a great tool for tattoo removal. The system can employ different laser colors, which is important for removing different color pigments. For example, green colors inks are best treated with red light. The short, powerful bursts of energy ensure that the tattoo ink particles reach a high enough temperature to be broken down without harming surrounding tissue. The process is safe and permanent yielding dramatic skin clearing results*. The Picocare 450 and the Lutronic Laser Tattoo Removal System works on any kind of tattoo; professional, amateur, cosmetic, traumatic, or colored. The Picocare 450 picosecond laser and Lutronic Q-switch laser is also capable of addressing other skin blemishes. Because it uses selective photothermolysis, dark skin blemishes such as freckles, age spots, vascular lesions, cafe-au-lait birthmarks, and lentigines are also treatable with this system. With a laser treatment, you can achieve refreshed skin tone with a clear complexion. Is Tattoo Removal for Me? There are many stories about people who get older and the tattoo they got when they were in their 20s or teens is no longer representative of who they are. There are also many cases where the effects of aging have cause the appearance of the tattoo to change. As tattoos age, the ink particles can fade or migrate, which results in a blurry image. What was once thought of as artistic and cool at one point in your life, may not be the case anymore. 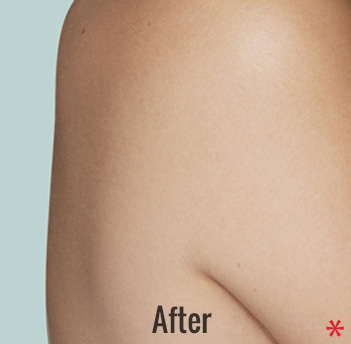 Another common reason for wanting a tattoo removed is due to professional appearance. Tattoos in prominent areas can present problems if clothing cannot easily cover them. Amongst those who have tattoos, nearly fifteen percent will eventually decide to have it removed. Regardless of your reasons, laser tattoo removal can give you the peace of mind and clear away an unwanted tattoo. To achieve the best results and avoid complications, you should be in good overall health, without a history of skin infection, or at risk of light-seizures. Pregnant women or those who just completed a tanning treatment are advised to wait. Candidates near one of our locations in Southern California can schedule a consultation and be on their way to clearing away the tattoos that have become an eyesore. During a consultation, our experienced physician will examine your tattoo and make a recommended course of treatment. Any questions you may have about the process can be answered, and you will be walked through the treatment steps. The treatment process is a simple experience. When you come in to have your tattoo removed, you will be sitting or lying comfortably depending on the location of the tattoo. The tattoo removal laser is a hand-held device that is held over the target tattoo. Laser pulses are beamed towards the skin; each pulse lasts only a billionth of a second. Typically, a white layer of “frosting” can appear over the tattoo as the laser energy is absorbed. This a good sign, indicating the start of the body removing the tattoo’s ink particles. The experience is often said to feel like rubber bands being snapped on the skin. For some patients who find this uncomfortable, there are topical numbing agents available. Applying topical numbing agents will add some time to the treatmenanession as they take about half an hour to set. The treatment session can take as little as fifteen minutes, and you will be back on your feet, returning to normal activities. Some people experience redness and swelling of the treatment area, but this will disappear after a few days. Antibacterial ointment and gauze are applied to prevent infection. 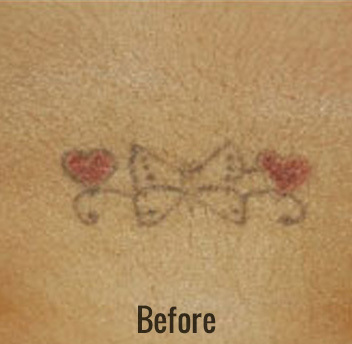 One of the perks of a laser treatment compared to other forms of tattoo removal is that there is little to no downtime. Laser tattoo removal is non-surgical and will not involve a single incision. Patients may experience some flaking, redness, and sensitivity. In the immediate days after your treatment session, it’s recommended that you avoid too much sunlight and refrain from tanning treatment. After the bandages are taken off the tattoo, your results are visible. For some people earlier in their treatment course, it’s best to take a before and after photo for comparison. With a comparison photo, the amount of tattoo reduction is really clear. In the weeks following a treatment, the tattoo will continue to fade as your body naturally processes the broken down ink particles. Additional treatment sessions are typical, spaced a couple of weeks apart to give your body ample time to process the particles. The number of sessions is highly dependent on the size and quality of the tattoo. Large body tattoos with many colors will require more sessions than a small, single color tattoo. Many patients experience significant removal by the third or fourth treatment session. When your final treatment session clears away the tattoo, the results are permanent. 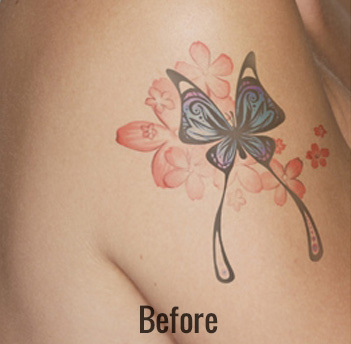 The ink particles of the tattoo have been completely removed and processed by the body, leaving a clear complexion. The cost of a laser tattoo treatment varies due to a number of aspects such as the quality of the tattoo, the number of treatment sessions required for complete removal, and which tattoo removal treatment chosen. Older, faded tattoos against fair skin tend to require fewer treatment sessions for example. Some patients may opt to take advantage of their laser treatment session to remove other skin blemishes as well. To determine an accurate cost, schedule a consultation today.